I guess by now, we all know that Tumblr is not going away anytime soon. Starting as a micro blogging platform, it has become a large network of creative individuals who like to share creative stuff to each other and the rest of the Internet world. The platform has evolved into becoming a home of many innovative ideas as well as a great tool to find inspiration from. With a large audience and a very supportive community, it is quite essential for artists, writers, designers, and other creatives nowadays to have Tumblr accounts. It does not only provide them an avenue to gain reviews and criticisms from peers but having a Tumblr page is also one way to showcase their works to clients and make them into business websites. With these reasons and other uses of Tumblr in mind, we present to you this list of the most popular and the best Tumblr themes for this year. Meticulously selected and curated, these templates’ goal is to help you improve your Tumblr blogging experience. With a wide variety of blog types integrated with many awesome features and customization options, you are sure to build your Tumblr site just the way you want it. So, make sure you don’t miss this opportunity and grab the best template that suits your taste and caters to your needs from the list below. We’re starting with Fable, a beautiful grid-based Tumblr theme that is creative and perfect for any design or fashion blogs. 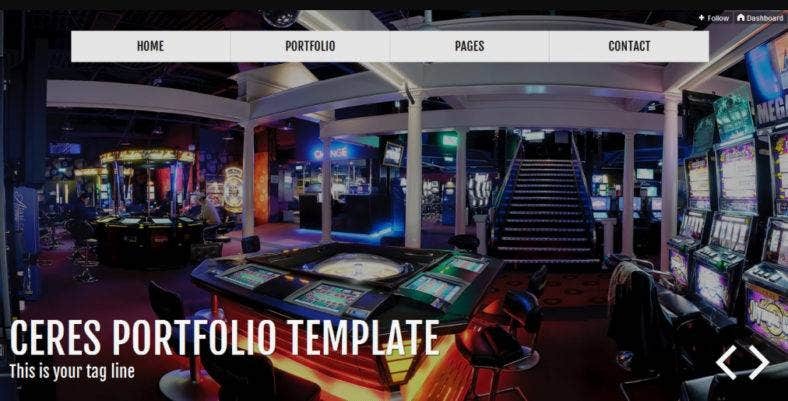 With a fullscreen image background that blends well with the images you post, this theme provides an absolutely stunning visual to your web page. The theme supports all types of posts such as images, audios, videos, text, quotes, and so on; along with its collection of features. Among these are the content-focused design, fully responsive layout, various color schemes, social sharing widgets, and so much more. 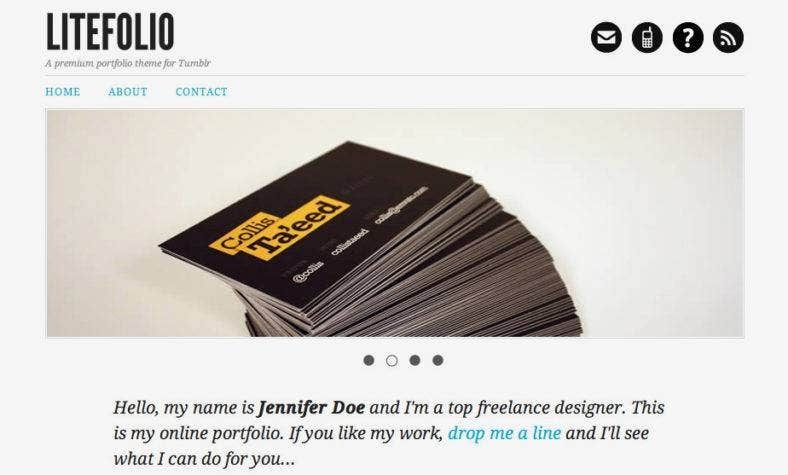 Next is this classic and minimalist website template for Tumblr which is Claudia. Ideal for anyone who needs a simple but nice looking blog template, this template also comes with a bunch of awesome features that will help you create a functional web portal for your works. Aside from its ample amount of white space and gorgeous typography, this elegant theme features all post types support, a fully responsive design, social network links, and tags among others which make this theme suitable for photography portfolios and blog websites. 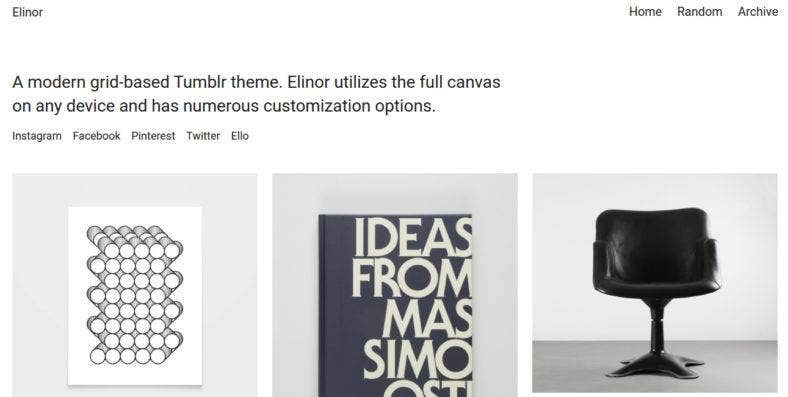 Elinor is a clean and simple Tumblr template with an ultra minimalist aesthetic that highlights your content the most. It has the modern grid-style layout over a responsive design that utilizes that whole page canvas and displays your content in a beautiful way no matter the device. Loaded with a bunch of powerful features, the theme allows you to personalize its look with choices of colors, fonts, and layouts. You can also use your own business logo and add your own links to the navigation menus, together with a lot more capabilities this template offers. 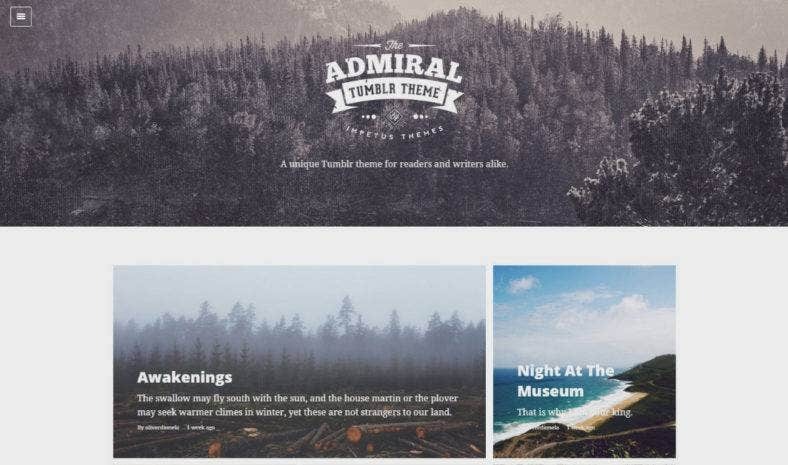 On the other hand, we have this vintage Tumblr template which main goal is to provide a unique Tumblr website for writers and readers alike. With a responsive web design, grid-based layout, and all post types support; you get all the essential features you need for your website. Admiral provides you the perfect way to display previews of your content in sections with beautiful image backgrounds. It also features a multi-level off-canvas menu for mobile viewing, along with different form modules, social media widgets, Google Fonts integration, and more. A dark yet elegant website theme for Tumblr, October is characterized by a masonry-grid layout over clean black background. Perfect for all designers and artist out there, the theme also comes with powerful features that help you create a well-structured blog or portfolio website. Among this theme’s key features are cross-browser compatibility, fully responsive layout, infinite scroll option, and a dozen more options for customization. It also lets you feature high-resolution images with tons of colors you can choose to personalize your website. 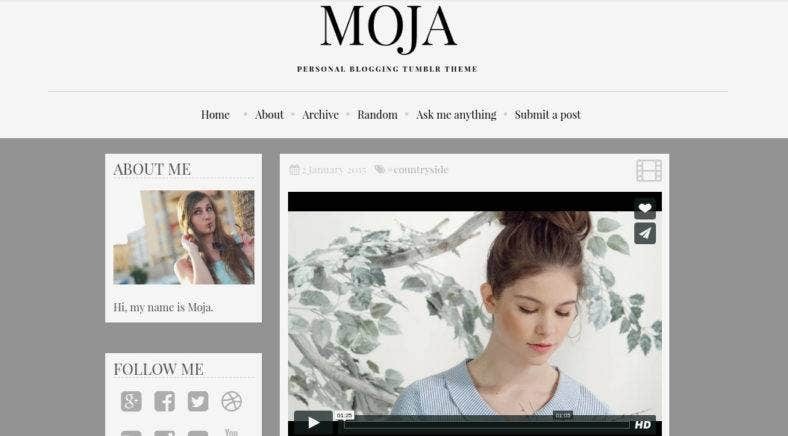 Moja, on the contrary, is a neat and personal Tumblr theme with 4 header variants, 2 background choices, and 2 pagination options. With these customization features, you are guaranteed to build a website that is according to your preference and needs. Built with Bootstrap and coded with HTML5 and CSS3, this theme includes a DISQUS commenting system, latest Tweets widget, and Google Analytics on a fully responsive layout and mobile-ready design, making it perfect for any types of blogs or personal websites. 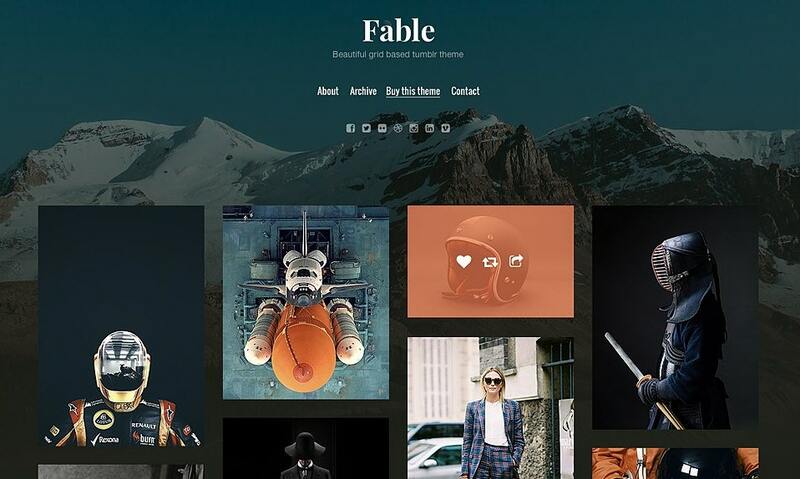 Classic and stylish, NeatFolio is an awesome portfolio Tumblr template for photographers, illustrators, designers. and other creative individuals. With a featured slideshow placed on top of your page, it lets you showcase you best works where people can see it best. Also, this theme includes features an “About Me” sidebar box with contact link, a drop-down menu for featuring different tags, infinite scrolling, and group blog support as well as customizable colors, typography, and other design details that let you tell a story. The white space-laden, responsive and creative Tumblr template you see above is great to use to give your blog, personal website or portfolio a sophisticated and professional look. Packed with almost a hundred customization options, Flora will help you stand out from the rest. There are many key features included in this template that lets you perform many uses, such as selecting post by tag and filter according to your wishes, show your headline post with a recent post sticker, and display your photos feed with type grid and slide effects among others. This unique and exquisite blog and photography Tumblr theme has a book-inspired design. It allows you to fill the pages with your story or collection of images while keeping them together with a fantastic book-like cover, a title, and a description among other cool features. These other features include a customizable sidebar, infinite scroll, a show and hide toggle, various color palettes, left-align or center alignment options, and a lot more amazing attributes. This looks fantastic especially for text and image-heavy post. 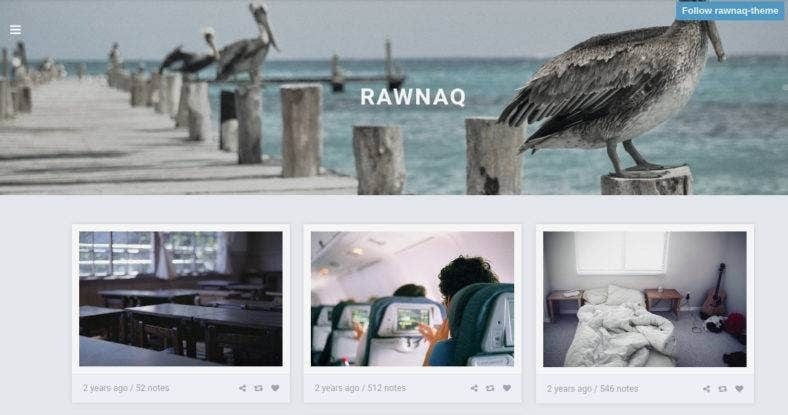 Rawnaq is a responsive portfolio theme for Tumblr with grid-based layout that is perfect for compiling all types of content, which are not just limited to images and text. With an extensive list of features, you get a highly functional website with this theme. As mentioned, it comes with a group of awesome attributes which include a custom logo image, infinite scroll, social links and widgets, cross-browser support, retina-ready design, all post formats support, DISQUS comments, and many others. 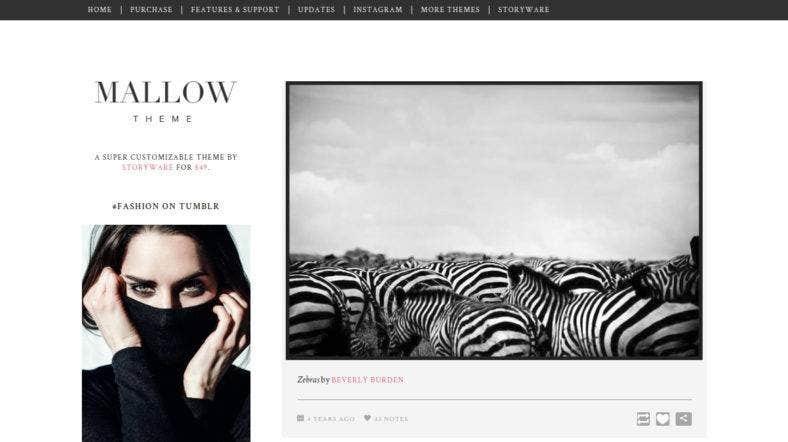 Another neat and gorgeous Tumblr template is Mallow. It comes with a black and white color scheme with elegant typography over a stark white background and well-structured layout. These features make this theme just right for photography blogs. Other than that, it can also be used as a text-based blog or a creative portfolio as its visual aesthetic makes sure that its content is highlighted. It also includes other features which allows you to customize and personalize your Tumblr blogs. 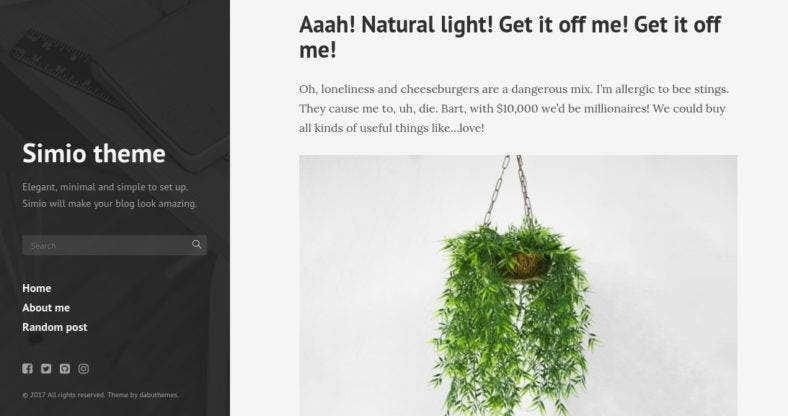 A dark Tumblr template that is characterized by an image-based masonry grid-style design. 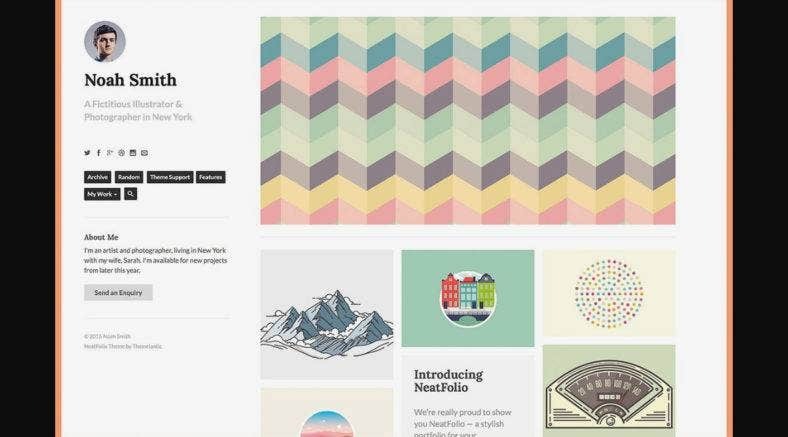 This makes Foundation a one-theme-fits-all web design tool that can be used for different types of websites, such as portfolios, blogs, and personal pages. It also provides some useful features that boost its functionality and distinctiveness. This includes an ultra-responsive design, a slider with a customizable loading bar, random header backgrounds, a choice of infinite scroll or traditional pagination, etc. 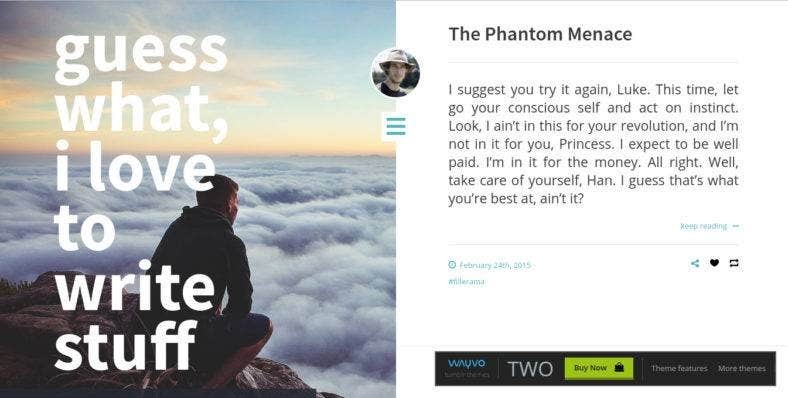 As indicated by the given moniker of this premium Tumblr template, Two has a clean and minimal design where that page is split in two. This makes the theme great to use as a platform for text-based content and run your Tumblr blogs in style. This template also comes with a beautiful typography that is easy to read, a super clean white background with an accent color, a custom photo background, and a fully responsive layout. All these can be modified from the theme customization menu. Simio is a simple but elegant Tumblr template that has a clean visual aesthetic yet packed with robust features that makes your blog or portfolio website look amazing as well as extremely utilitarian. A great choice for both bloggers and photographers. Among the many features that this template includes are a responsive design, all post types support, Google Analytics and use tracking, over 800 Google Fonts, social media links, social media sharing, RTL support, and so much more. 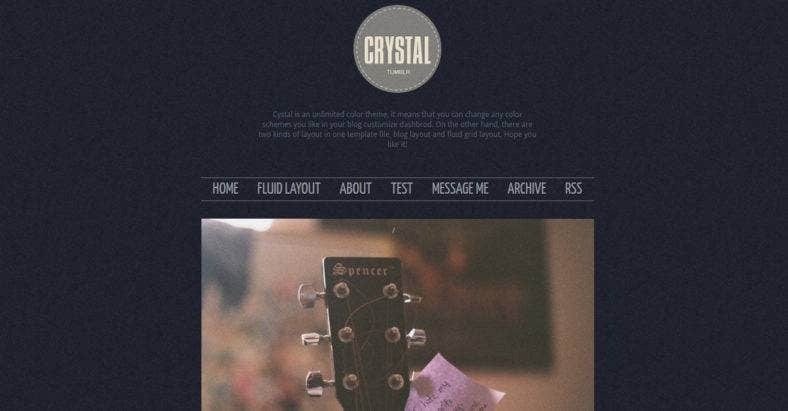 This magazine-style Tumblr theme allows you to display your content in a stunning way that looks good in all devices. 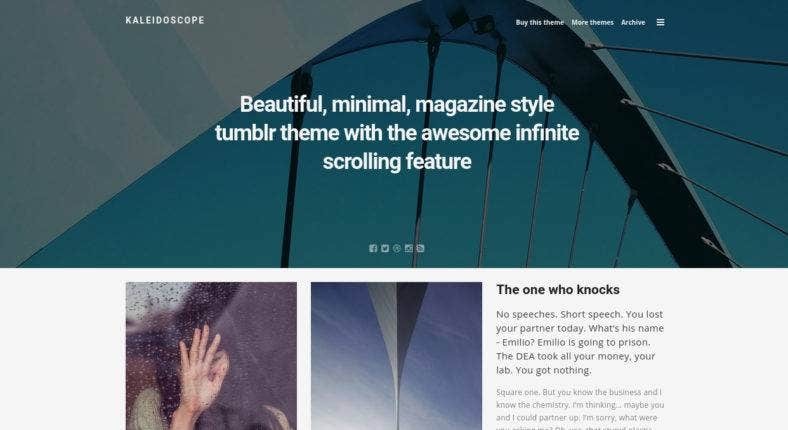 Kaleidoscope is beautiful and minimal with lots of features included in the theme to build an equally gorgeous blog or web page. It comes with a content-focused design that is customizable with different color schemes, Google Fonts, and so much more. Other features are all post types support, social sharing widgets, Google Analytics, DISQUS comments, and others. Clean and minimalistic, Litefolio is a portfolio Tumblr theme with an awesome jQuery slider that is perfect for any designer, photographer, and illustrators to showcase their works. Simple and easy to use, it supports both text and image types of posts. This template also comes with 0ver 30 Theme Options available which helps you customize the colors and fonts of your website as well as many other possibilities like uploading your own logo and background image, write your intro text, etc. Another colorful and bright Tumblr template is Swatch, a great theme to use by individuals who are looking to build a functional website which, at the same time, allows them to personalize the look of your personal blogs to suit your taste. Unlike most templates, this theme functions for every type of post with an ample amount of customizable design options. It features different background options, various custom widgets, additional pages support, and Google Analytics. Crystal features a dark and solid design aesthetic despite its given name. Even though, it has an unlimited color scheme included in the template so that you can change the look of your page instantly, along with other many features. To start with, this Tumblr theme features two kinds of layouts, the blog layout, and fluid grid layout. It is also infinite scroll ready with integrated with a DISQUS comments widget, Google Analytics, Lightbox effect, and social networks icons. 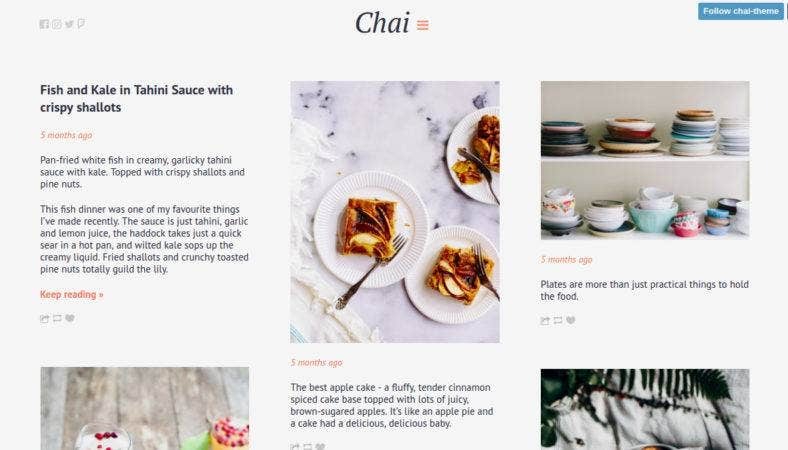 Minimal and gorgeous, Chai has a modern grid-based website design with a clean and adaptive layout that is perfect for people who want to share useful everyday stuff to others like recipes, movie reviews, store finds, and anything else personal. 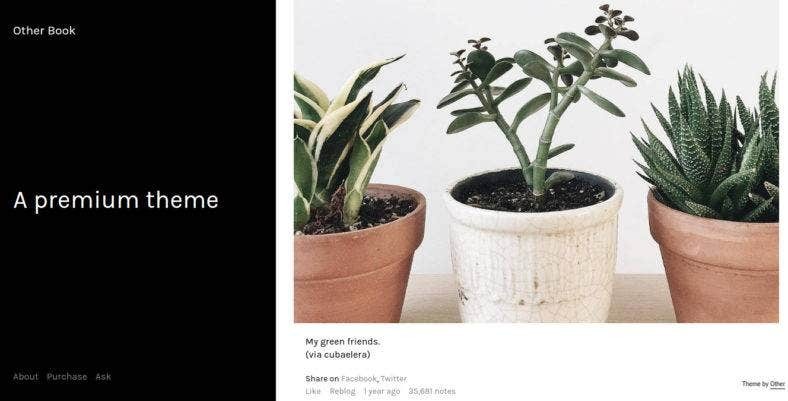 As it comes with a Pinterest integration, you can link your Pinterest account with your Tumblr one so it becomes easy for your visitors to share your content anywhere on the Internet. It has also a beautiful interface and countless features included. On the contrary, Ceres presents a bold and image-heavy design as it is a photography Tumblr theme that can be used for creative portfolios and blogs. With a responsive and mobile adaptive layout, it ensures your website works well on all devices. This theme lets you showcase your work in the most modern way with a state-of-the-art design that has over 80 options to choose from. It also comes with 6 slider variants with custom description and links, 8 categories, and up to 20 social profiles to use. To end this list, we have this beautiful floral Tumblr theme called Flora. Laden with a clean and feminine background with floral motifs, gorgeous typography and well-spaced grid layout with multiple columns, it’s great to use for any type of content. 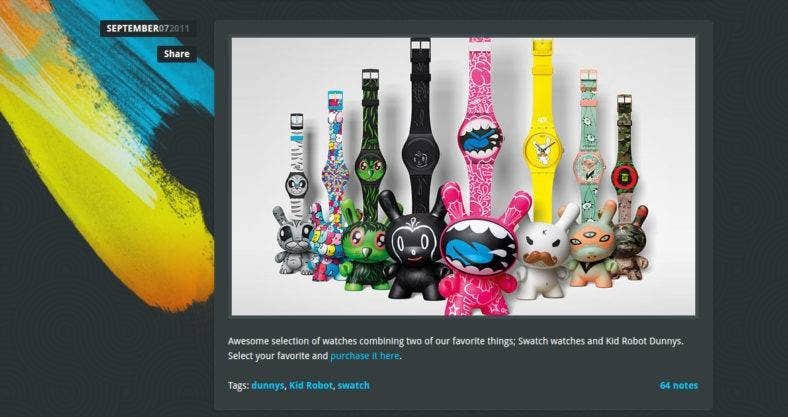 Aside from that, the theme is also loaded with features that let you customize the colors, fonts, sizes, images, text, icons, links, and other design elements. You can also choose between infinite scroll and pagination for navigation and many others. For more ideas and inspiration, you can also take a look at our list of Tumblr-style WordPress themes in case you need a more professional website for your businesses.